The ongoing Shanghai Cooperation Organization Summit will serve as a great opportunity for Qingdao to show the progress and achievements the coastal city has made during 40 years of reform and opening-up, local officials said. In 1984, the city in East China's Shandong province was designated as one of 14 Chinese coastal cities to open up to foreign investment. In that year, the province's first joint venture, a leasing company, was set up in Qingdao. Since then, an increasing number of foreign-funded companies have been established in the city. As of the end of 2017, Qingdao has attracted 271 projects with investment from 141 Fortune Global 500 companies such as Volkswagen, Siemens, Bombardier and Amazon. The city's employment of foreign investment has cumulatively exceeded $60 billion. The opening-up policy has also played a key role in revitalizing the traditional manufacturing base in China. "The same year Qingdao was listed among the 14 pilot cities, the city government decided to make foreign investment utilization a priority in its opening-up, as well as introducing advanced technologies and transforming old companies," said Xu Jian, a senior official at the Qingdao commerce bureau. Benefiting from the use of overseas technologies and capital, a group of Qingdao-based manufacturing companies, including Haier, Hisense, Tsingtao Beer and Aucma have grown rapidly in scale and become more influential in both Chinese and overseas markets. Home appliance giant Haier, for example, currently has set up 10 research centers and 108 production facilities around the world, with its products sold in more than 160 countries and regions. 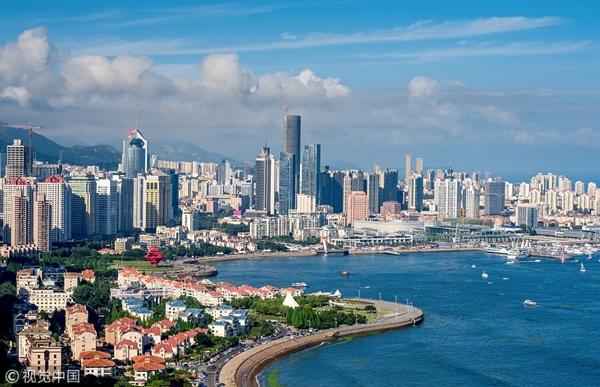 In addition to commerce, Qingdao has also attracted high-end international resources in the fields of science and technology, culture, tourism and sports in recent years to promote its economic development and boost its international profile. The city has established an international cruise liner home port at Jiaozhou Bay, which was opened in 2015, and has so far docked 220 ships. Qingdao has also hosted a series of international sailing events and introduced a youth soccer training system from Germany. 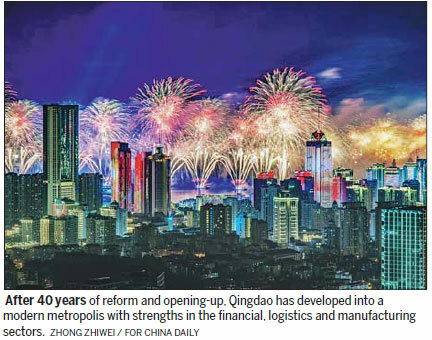 With its efforts to form a new pattern for an open economy, Qingdao has grown from what can be termed a junior international city to that of a higher level, playing more roles such as a regional economic center, a gathering place for international resources and a portal for communications and exchanges with foreign countries, according to a recent report by Price Waterhouse Coopers. The Belt and Road Initiative, proposed by China in 2013, has opened up a window of opportunities for the coastal city to further deepen the opening-up strategy and accelerate its process of internationalization. Qingdao has been designated as a hub of the New Eurasian Continental Bridge Economic Corridor and a strategic city of maritime cooperation in the development of the Belt and Road Initiative. Grasping these advantages, the city has organized over 40 trade and economic events in 30 countries involved in the initiative to promote two-way investment and trade cooperation. In 2017, import and export volumes between Qingdao and countries involved in the initiative reached 248.53 billion yuan ($38.76 billion), an increase of 11.2 percent year-on-year.